DSW Inc. slightly reduced its guidance for the year due to lower expectations for Ebuys and the impact of weather related disruptions this quarter. “At Ebuys, we’ve moderated the long-term financial expectations and have reduced its carrying value on our balance sheet. However, we believe the business provides valuable expertise to manage end-of-season clearance through online marketplaces. The successful integration of this business will unlock future synergies across our brand portfolio,” Mr. Rawlins concluded. Sales increased 1.7 percent to $708.3 million.Comparable sales decreased 0.4 percent with a negative impact of 50 to 60 bps from hurricane disruption.Reported gross profit decreased by 120 bps due to our market share initiative, higher shipping expenses and costs related to the integration of Ebuys. Reported operating expenses, as a percent of sales, increased by 20 bps, with higher technology and marketing expenses offset by lower overhead costs. Reported net income was $4 million, or 5 cents per diluted share, including pre-tax charges totaling $52.7 million, or 40 cents per diluted share, related to net non-cash impairment charges related to goodwill and intangible assets, offset by a reduction in contingent consideration related to the company’s acquisition of Ebuys. In the year-ago period, earnings were $47 million, or 47 cents a share. Adjusted net income was $35.9 million, or 45 cents per diluted share, including weather related impact of approximately 5 cents per diluted share That’s down 13.9 percent from $41.7 million, or 51 cents a share, in the same period a year ago. The company updated its long term expectations for Ebuys based on its performance over the last eighteen months. Although Ebuys brings valuable proprietary capabilities to compete on digital marketplaces, the company believes it is necessary to moderate the growth assumptions assumed at the time of the acquisition. As a result, the company significantly reduced its future contingent liability while simultaneously impairing the carrying value of goodwill and intangible assets related to the original target price of the acquisition. The total net non-cash charges related to the impairment of Ebuys’ goodwill and intangible assets was $52.7 million, or 40 cents per diluted share, and is not included in the company’s Adjusted results. Sales increased 2.1 percent to $2.1 billion.Comparable sales decreased 1 percent compared to last year’s 1.6 percent decrease.Reported gross profit decreased by 80 bps, driven by incremental clearance activity and inventory reserves and distribution costs related to the ongoing integration of Ebuys. Reported operating expenses, as a percent of sales, improved by 10 bps due to tighter expense management.Reported net income was $55.6 million, or 69 cents per diluted share, including pre-tax charges totaling $59.9 million, or 45 cents per diluted share, related to acquisition and impairment costs, restructuring expenses and foreign exchange loss. Adjusted net income was $92.2 million, or $1.14 per diluted share. 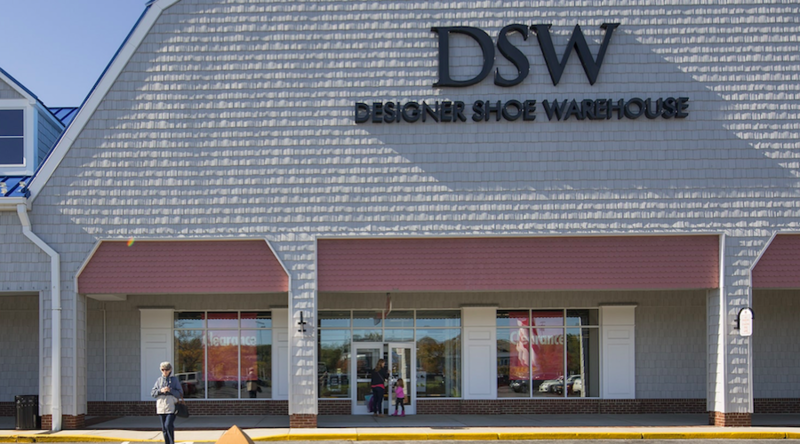 DSW Inc.’s Board of Directors declared a quarterly cash dividend of 20 cents per share. The dividend will be paid on December 29, 2017 to shareholders of record at the close of business on December 15, 2017. The company updated its full year outlook for adjusted earnings in the range of $1.40 to $1.45 per diluted share to reflect lower expectations for Ebuys and the impact of weather related disruptions this quarter. Guidance does not include net charges related to the impairment of goodwill and intangible assets. Previously, adjusted earnings were expected in the range of $1.45 to $1.55 per diluted share. Golfsmith’s Thompson to Steer Performance, Inc.